56 years and a few days ago, Dr. No premiered on the fifth of October 1962 at the London Pavilion. To the black tie premiere, James Bond creator Ian Fleming was elegantly dressed in a double-breasted shawl-collar dinner suit paired with a batwing bow tie. Dr. No‘s director Terence Young wore a single-breasted shawl-collar dinner suit in something lighter than black or midnight blue (all photos of the premiere are in black and white) with silk gauntlet cuffs and paired it with a narrow batwing bow tie and folded white pocket square. Sean Connery, on the other hand, didn’t entirely follow Bondian standard of dress with one horrible mistake. 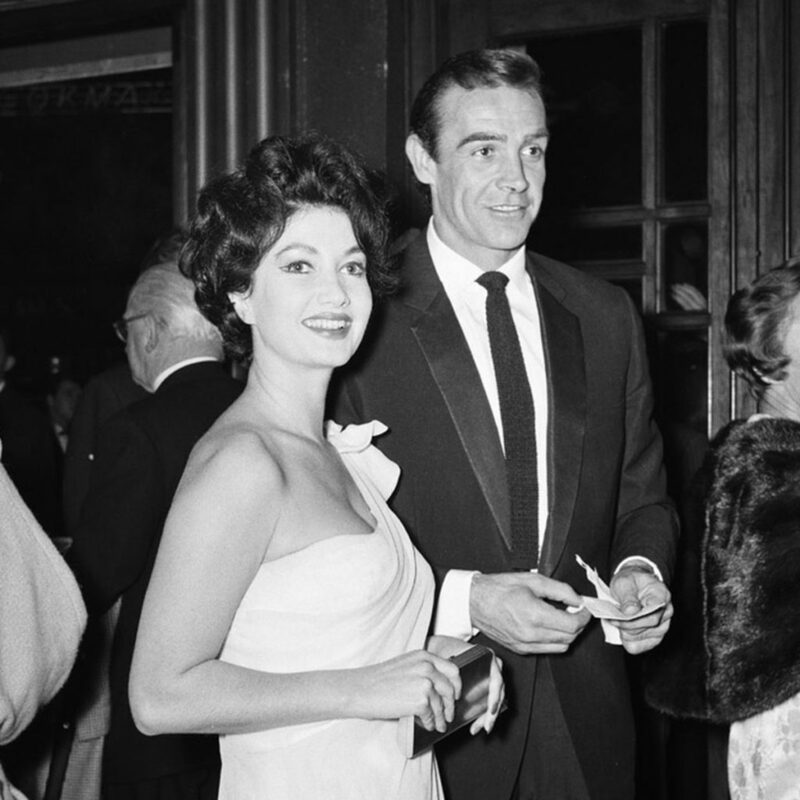 On the 12th of December 2001, Christie’s in South Kensington sold a dinner suit made by Maxwell Vine for Sean Connery dated the 5th of January 1961. The dinner suit sold for GBP 2,056. Despite Sean Connery famously not being comfortable in a suit before James Bond, he had bespoke tailored clothes before he got the role. Though all photos of Sean Connery at the Dr. No premiere are in black and white, this Maxwell Vine dinner suit matches up with what he wore on this special occasion. Maxwell Vine was a tailor located at 7 Sackville Street (the auction listing incorrectly says “Sackwell Street”), a street of tailors in Mayfair nearby London’s famous tailoring street Savile Row. Currently at 7 Sackville Street is another tailor, Kent & Haste. The currently revived Anthony Sinclair now under control by Mason & Sons briefly operated next door at 6 Sackville Street. Roger Moore’s tailor Cyril Castle operated a few doors down at 10 Sackville Street during the time Connery visited Maxwell Vine for this dinner suit. Vine was a celebrity tailor who also made clothes for Christopher Plummer, Robert Mitchum, Michael Winner, Laurence Harvey and Ray Ellington. Sean Connery’s dinner suit is made of a textured cloth, and its shiny and crisp look suggests it is a wool and mohair blend. The jacket has moderately narrow notched lapels. 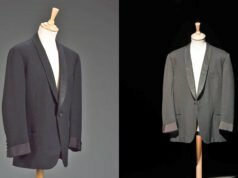 In the early 1960s the notched lapel dinner jacket had come into popular fashion, after making only occasional appearances since its inception in the late 1800s. Traditionalists still often write off the notched lapel dinner jacket as a fashion piece or a cost-cutting measure because it has the same lapel as an ordinary suit jacket, but Sean Connery was wearing a dinner jacket of the latest fashions at the Dr. No premiere. Connery would later wear notched lapel dinner jackets as James Bond in Goldfigner and Diamonds Are Forever, and Roger Moore and Timothy Dalton also wear them as Bond. The jacket’s notched lapels are nontraditionally faced in red and black shot silk. Shot silk is an iridescent silk woven with the warp and weft in different colours. Depending on the angle the silk is viewed from, one of the two colours will be more visible than the other. Red is the most traditional colour to add to an outfit for black tie, often in a cummerbund or boutonnière, and red has a striking look in the evening that does not look out of place on this dinner jacket. Sean Connery would later wear another dinner jacket with red and black notched lapels as Bond in Diamonds Are Forever. Apart from the lapels, the dinner suit has a traditional style and cut. The single-breasted jacket fastens with the classic single button, and it has a low button stance to enhance Connery’s V-shaped torso. 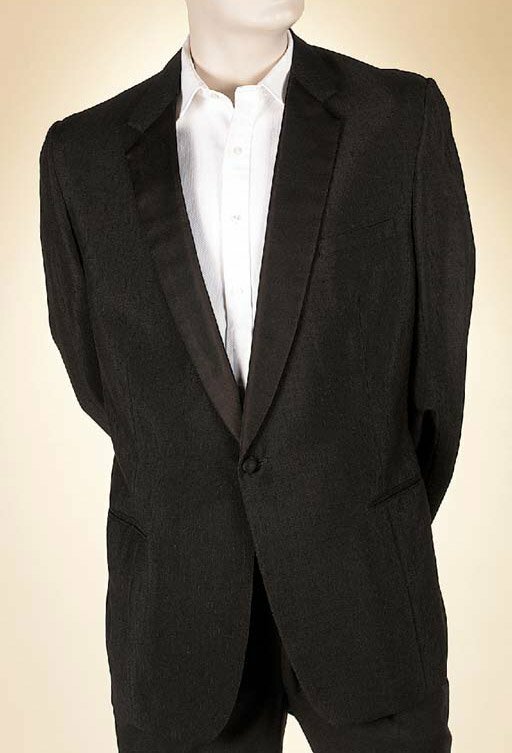 The cut of the dinner jacket is similar to the Anthony Sinclair suits that Connery wears as James Bond, with soft shoulders, roped sleeve heads, a full chest, a gently suppressed waist and a close-cut skirt. The jacket has a self welt breast pocket and a self jetted hips pockets. The sleeves are finished with self gauntlet cuffs trimmed with a braid and fasten with three buttons. The dinner jacket has no rear vents to follow black tie traditional. The trousers have reverse pleats (outward-facing), gently tapered legs and tighten at the waist with “Daks tops” button-tab side-adjusters. Down the outseam of each leg is a black silk braid, a traditional alternative to a stripe that matches the lapels. Rather than a traditional dress shirt, Connery wears one of his white Sea Island cotton poplin shirts from Dr. No. The Turnbull & Asser shirt has a cutaway collar, a narrow front placket with mother-of-pearl button and two-button turnback (cocktail) cuffs. 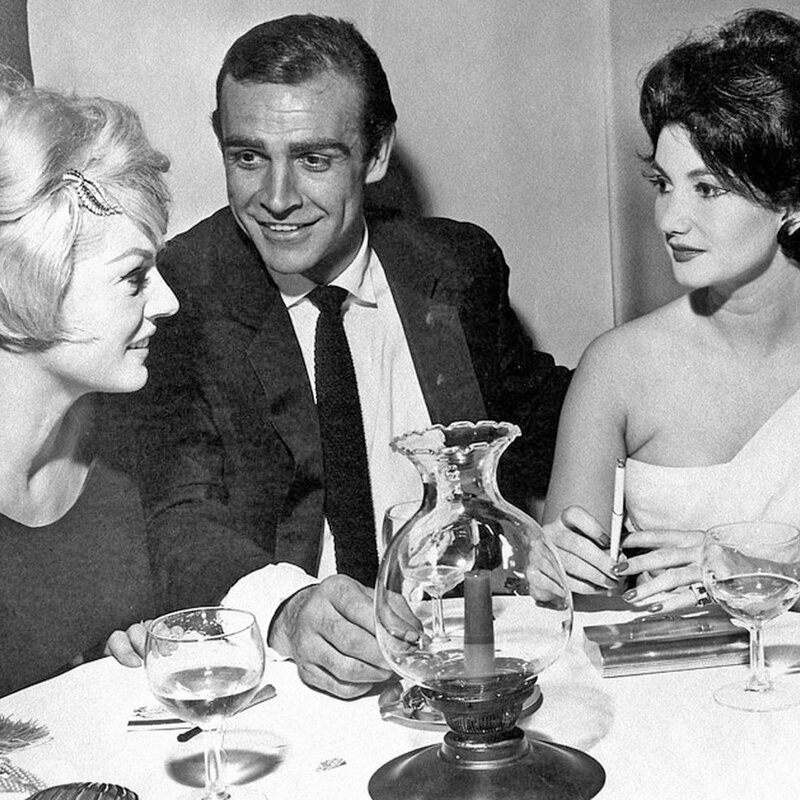 This is the same shirt he wears with his grey mohair-blend suit in Dr. No when he meets Quarrel. Though this shirt is not ideal for black tie, a plain white shirt in an ordinary poplin can still make do for black tie as long as it has a point collar or spread collar, double cuffs—either the traditional kind that takes cufflinks or cocktail cuffs—and no pocket. White-on-white cotton, cotton voile or silk could take this ordinary style and make it more special for black tie. Sean Connery not only wears his shirt from Dr. No but also his shoes. His cap-toe three-eyelet derby shoes with heel counters are likely the same black calf leather shoes he wears throughout Dr. No. These are possibly made by bespoke shoemaker John Lobb Ltd. of St. James’s. Though the style is not the most traditional for black tie, they do not insult the tradition of black tie. The only place where Connery goes completely wrong with this outfit is wearing a straight-hemmed knitted tie. The black tie dress code demands a black (or midnight blue) bow tie, and any other form of neckwear is out of place when wearing a dinner jacket. Though long ties for black tie were not in fashion until the 1990s (never have they been stylish), Connery shows that people had done it before 1990s. When people wear a long tie for black tie, it is usually a black satin tie. Satin ties are the most formal long tie for the evening, but they should be worn with a suit rather than a dinner suit. A long tie competes with the dinner jacket’s shiny silk-faced lapels that would be flanking it if worn together. Connery’s knitted tie insults black tie tradition even more than a satin long tie. While a satin tie is made from the same silk most commonly used for a bow tie, the knitted tie is even more jarring and out of place, being the least formal variation on the long tie. Connery ties his tie in his usual Windsor knot, which does not make a knitted tie any more formal. Not even Fleming’s Bond, who loved the black knitted silk tie, wears it with a dinner jacket. Despite owning a fine bespoke dinner suit, Sean Connery shows at the Dr. No premiere that he does not know how to put a proper outfit together for black tie when he pairs a knitted tie with it. Dr. No‘s director Terence Young famously coached him on how to wear tailored clothes, but when left to his own devices Connery is not able to dress properly. Like many people not properly versed in traditional dress codes, he may have taken the “black tie” dress code literally. After all, he is wearing a black tie. When dressing himself, Sean Connery does not live up to the character he played on screen at this premiere. Necktie with a dinner jacket …. thought you knew better …. Anyone else care to add to the list? I think that’s Zena Marshall in the pics with him, who was unconvincingly made up in the film to look Chinese as Miss Taro. (I think in the fourth paragraph you meant to write ‘ordinary suit jacket’ not ‘ordinary dinner jacket’). Connery does come off as a bit clueless with this outfit. And I don’t think we can blame the pervasive influence of ‘casual hippy style’ creeping in this early in the decade! Such mistake for a guy so prominently under spotlight (after all he was there on premier to steal the show) is quite incredible. And no one to help him to straighten things before he made an appearance. Very interesting article one more time, I never saw these pics before. I would love to see the photographs of Terence and Ian from that evening. You can find photos at 007 Magazine. The key man can break the rules, though in this case one might almost suspect he was a bond villain. Did he order the red wine with fish? The guy is ( and always will be ) among my top 10 favourite actors , but Damn. 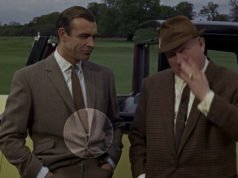 There is another very famous sartorial error committed by Connery in a film , which l came across. In 1987 , he started in a film called ” Untouchables ” alongside Kevin Cosner , Andy Garcia and Robert De Niro. The costume department used Armani to make the suits for every one. Connery , however , had his own bespoke tailor make him clothes for the film according to his style . In the film , he wears his dress trousers with both a belt AND braces ( a big sartorial No No , since they both perform the same purpose ) . Clearly , that was his own choice and not the wardrobe department’s , because all the other characters in the film wear either braces or a belt. I’ve seen that comment made before… but Connery’s character wears his revolver cross-draw, under his jacket. (with the caption commenting on his braces and belt). There is a whole ecosystem of suspenders used these days to hold up police pistol belts, some of which are worn under the shirt and emerge through small slots to support the belt (I guess to avoid BondSuit/BAMF style shaming). Connery here is being… bleeding edge? That sartorial goof didn’t prevent him to deliver a stunning performance, perhaps one his better parts. It’s a shame that Connery was showing his amateur side of fine clothing in the premiere despite an excellent dinner suit made for him. It’s the tie that brings the look down by a huge margin and would have been better if he used and new the proper neckwear whixh is a black or midnoght blue bowtie. At least his Bond was a very elegantly well-dressed man with a fine taste of clothing and lifestyle. Isn’t it a bit scholarly to belabour that? I think it’s unfair to blame Connery time and time again for buttoning all buttons on his suit jacket etc. I am pretty sure that you can find such no-gos for every Bond actor – you just have to look for it long enough. 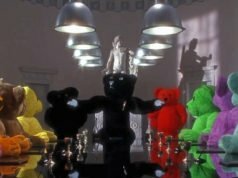 I understand that this blog is first and foremost about the Bond actors’ on-screen and not their off-screen appearance. And on-screen, Connery is a very smart-dressed Bond (in my book THE best dressed Bond). However, anyone can be a gentleman of style if they are coached properly (and listen), but a true stylish gentleman can only be one who is as smartly dressed off screen as he is on-screen (Roger Moore and Pierce Brosnan for instance). This is nothing but a myth created by die-hard admirers of those two. There are numerous examples for both Brosnan and Moore not being well-dressed off-screen (and on-screen as well!). Furthermore it is quite evident that Connery’s wearing a knit tie with his dinner jacket was meant as a practical joke. I don’t understand that fuss which is made about it. I can never shake the association long black ties have with funerals, and cringed when they became ‘fashionable’ in, as you say, the 1990s. Can never understand anyone sheepishly following ‘fashion’ when the look is for sh*t. Skinny suits that look as though they’ve been thrown in a washer and dried at too high a temperature. Who would ever have thought the shrunken jacket worn by Charlie Chaplin for comic effect would end up being fashionable. Many thanks for the amazing pictures, Matt. Dr. No is iconic to me. I’m sure he meant it to be ironic and did this on purpose. James Bond loved black knitted ties, and so, Connery decided to wear one even with a dinner suit, as a joke.